This is a good ECE project report on Development of Serial UART from Mini USB and aims to convert USB data into serial data. Here USB is connected to PC. By using USB to serial chip we are converting into serial data. So, converted serial data which is in TTL logic can be read by Micro controller serially and displayed in the LCD. 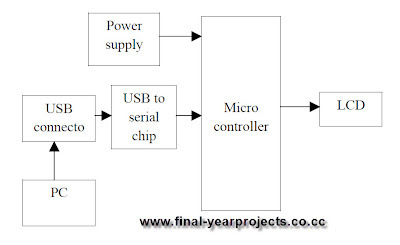 The main Hardware component of the project are Microcontroller, Power supply, USB Connector, PC, LCD. Software used for the project are Keil u-Vision for microcontroller programming, Embedded ‘C’ & Express PCB. You can also Subscribe to FINAL YEAR PROJECT'S by Email for more such Projects and Seminar. 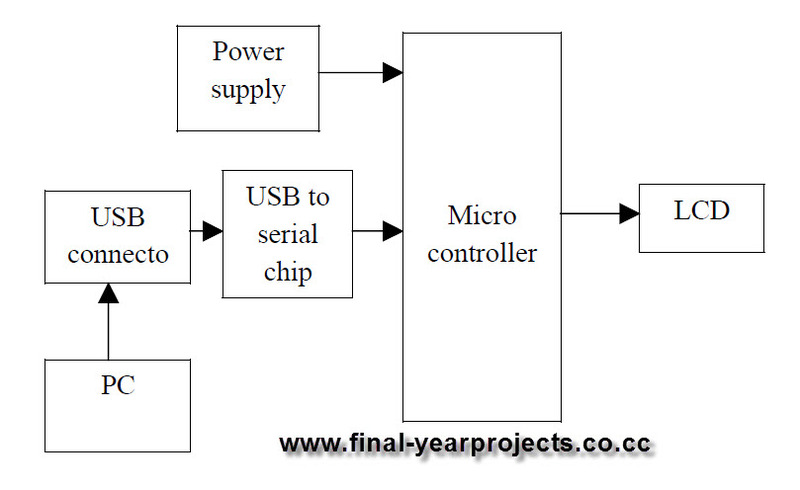 The above image shows the block diagram of Development of Serial UART from Mini USB. Report includes complete circuit diagram, working of the project and future scope. Use this report for your reference and study only.